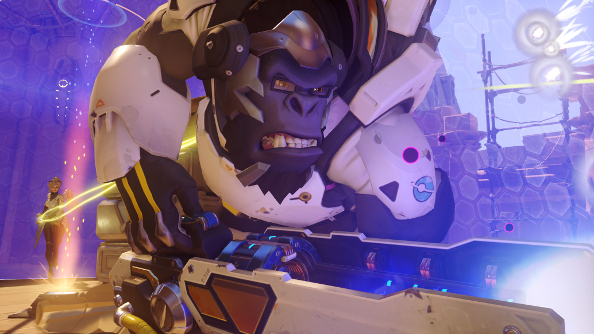 This is the Overwatch hero preview trailer I’ve been looking forward to: Winston’s. He’s a scientist and adventurer, with a fancy Tesla cannon and a nifty jump pack. Oh yeah, and he’s also a gorilla. You can watch him leap around the battlefield, electrocuting enemies, in the trailer below. Winston seems a bit tanky. His Tesla cannon fires short range blasts of electricity, he can close gaps by employing his jump pack, landing and stunning foes, and he can also fire up his shield protector, which soaks up damage but still lets Winston and his allies fire from within it. His ultimate ability, primal rage, makes him tap into his animalistic side, boosting health, damage and how frequently he can use his jump pack. While in primal rage mode, he can only use melee attacks. Overwatch’s beta begins in the autumn.